Anyone care for a Mary Lou story? Something’s been nagging at me, lately. I have all these memories of stuff, and I like to write, and a few people (family members) have said on more than one occasion, “you should put all those stories together and write a book.” Let me give you my two main excuses for not doing it. (1) I don’t think anyone would read a book that’s filled with 4 wedding toasts, a speech I gave in college, 5 eulogies, and then 5 or 6 stories on top of that. (2) I tend to embellish things and I would regret if my memory of something has been distorted over time and my version of the stories turn out to be only 75% accurate (or less). Not like I’m saying I’d write a story about my “Uncle Stephen” and then everyone would be like, “Don, you don’t have an Uncle Stephen.” It’s more like I’d remember a single memory and try and fill in details, but the details of a specific Thanksgiving might blend together multiple Thanksgivings and possibly a Christmas and, well, what good is a story like that? But here’s a story I know is completely accurate. My Mom (Mary Lou, for those of you new to my blog) loved Christmas. Our house was madness. Multiple tea kettles, a snowy old-time village of miniature light-up houses all over the place, a model train that drove through that miniature village, specific mugs that only came out between Thanksgiving and replaced the every day mugs, and candles and runners, and Christmas art that replaced the year-round art on the walls and a giant Santa head that hung over our fireplace. And much . . . much . . . more. Even my Dad got in on the act and when we moved to West Michigan. We lived in a neighborhood that prided itself on elaborate light displays. It was the type of neighborhood where, on most evenings, cars would drive through the streets at 5 miles-per-hour gazing at hundreds of houses decorated to the max. Well, coming from Sterling Heights, I seem to recall we had lights outside, but nothing like what my Dad did in Kentwood. He rigged lights that were in the shape of a two-story Christmas tree in front of our house. It was like a May Pole, but with Christmas lights. I suppose some wives would frown on an upstairs window being ajar an inch for more than a month, allowing heat to escape and for a crazy snowy-ice-dam to form on the soffit vent and in the gutter, but for the sake of a quality outdoor light display, Mom didn’t mind. 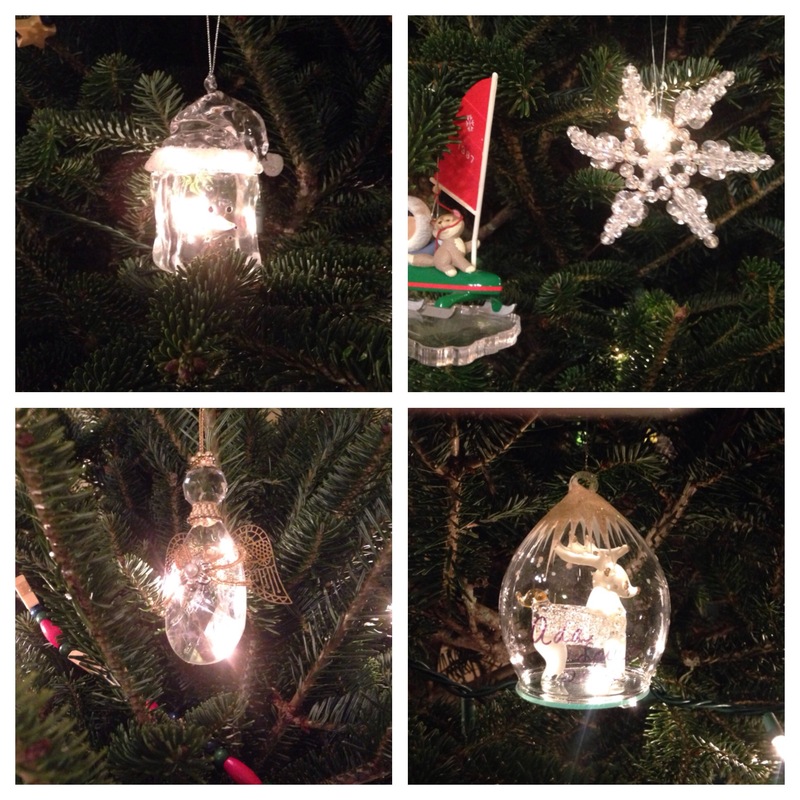 The Mary Lou story that I’ve taken with me into my marriage (and I realize this might not be my Mom’s sole invention or theory) and am passing along to my kids is this – any glass or crystal ornament should be hung directly in front of a light on the tree. It’s imperative. When we were younger, we’d all help hang ornaments and in typical childlike fashion, every ornament was hung at the bottom of the tree, no higher than 4 feet (as high as we could reach). Then, later that evening, once we were all in bed, Mom would go to work re-arranging the ornaments to perfection. A properly ornamentized tree should be equal parts novelty ornaments, religious ornaments, meaningful souvenir ornaments (likely from an exotic travel destination), mixed with a blend of standard, solid color ornaments (in our house, it was burgundy and gold) to match the color scheme of ones home. The burgundy and gold should be a pure 50/50 mix and no single color should dominate any quadrant, nor the top-half or bottom-half. And most importantly, as I’ve mentioned, glass or crystal ornaments must be hung in front of a twinkling light to highlight them and make them shine. I can only imagine, now, if she came to my house and saw an ornament hung incorrectly, she’d probably move some ornaments around when we weren’t looking. She loved Christmas. I think most everyone could agree on that. Only someone who loved Christmas and celebrated it as a season of giving would spend the better part of 200 hours shopping for the perfect gifts to wrap (perfectly wrapped, I might add) under a perfectly decorated tree. Thansk, Mom, for loving Christmas and loving us.